Admission: No charge for Nominees and/or their representatives. (you must present your membership card and be a member in good standing). Dress code: Clothes required (especially in January). This is not a black tie affair, but if you want to put on the dog, have at it. After the Awards Presentation: Session Upper Cellar 6 PM to 8 PM. Public invited. 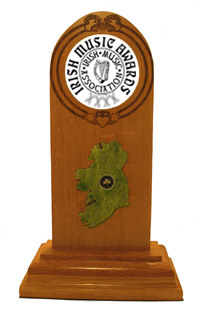 About the Award: At a time when it is very easy to go to an awards/trophy shop and pick up a chunk of granite and put someones name on it, the membership of the Irish Music Association has decided to go with awards that are made with art and symbolism. Made by The Irish hand, materials are incorporated that represent the Irish and Ireland. Elements Connamara Marble, Durmast/Sessile White Oak, crystal, secret compartments, and IMA authentication is what makes up this year's Irish Music Award. Yearly Conference: A yearly conference for our IMA membership to determine policy of the association, the awards, and discussion of Irish music, artists, etc., is held each year before the awards presentation. Previous Irish Music Awards: The Irish Music Awards are held at O'Malley's Pub in Weston, MO, USA. O'Malley's Pub is sixty feet underground and the most unqiue place you will ever stand a pint. Video of the events are available on line in the IMA store.